July 10, 2015 - PRLog -- Many marketing departments are struggling to rise above the noise being created by various factors in today's business environment. From increased competition and new technology to demanding customers and internal organizational noise, it is getting harder to create and deliver messages that capture customers' attention and appeal to their needs. While many changes have occurred, the core principles of good marketing initiatives remain: strategy, products, customers, brand, communication, operations, sales channels, and market analysis. 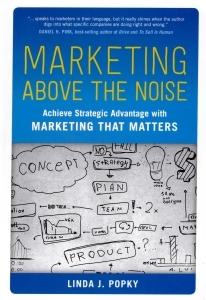 In Marketing Above the Noise, Linda J. Popky shows how combining these principles with momentum factors, including organization commitment, resources, people, technology, and environment, can help marketing rise above the noise by creating targeted initiatives that resonate with customers and achieve business goals. *In the heart of the noise. Noise causes businesses to focus on the wrong things and lose sight of their customers. Companies can cut through the noise by understanding the dynamics of their markets, listening to what their customers want, and creating messages targeted to customer needs. *The tempo accelerates. Technology has created an environment where customers get what they want faster and more easily. Companies must choose the technologies that will enable them to quickly deliver quality products, services, and support. *The new realities. The new realities of today's marketing environment require companies to take a different approach to delivery, data, demand generation, and drivers. They must dig into who their customers really are and deliver the content they want, where and when they want it. *It all starts with the customer.As customers put more demands on companies, businesses must listen to them and show them that their feedback is important. Many companies are now employing chief customer officers whose role is to hold their organizations accountable for their customers. *Branding above the noise. Because brands are always evolving, companies should measure their brand awareness at regular intervals and make modifications based on customer feedback. *Closing the sale. It is critical that sales and marketing work together as a team to meet customers' needs. By understanding each other's roles, they can partner to deliver consistent messages about their products and services, increasing their chances of closing sales. *How employees raise the volume. Employees can be the best marketers a company has, so it is important to engage them by asking for their ideas, listening to their feedback, and following up with them to let them know how marketing initiatives are working.